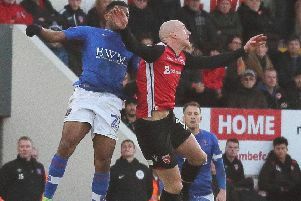 A poor second half cost Morecambe dearly as they suffered a heavy defeat at Cheltenham. The Shrimps conceded three goals after the break as they produced one of their worst performances for some time. Alex Kenyon then went close with a cheeky overhead kick from the edge of the box that looped just over the bar before the home said came into the game. The home side looked threatening from set pieces and used their height well with both Jamie Grimes and Taylor Moore failing to take advantage of free headers from Joe Morrell corners. Morecambe: Nizic, Winnard, Old, Lavelle, Conlan, Rose (rep Fleming 81), Kenyon, Wylde (rep Thompson 62), Wildig (rep Long 62), Ellison, McGurk. Subs not used: McGowan, Oliver, Campbell, Maher.